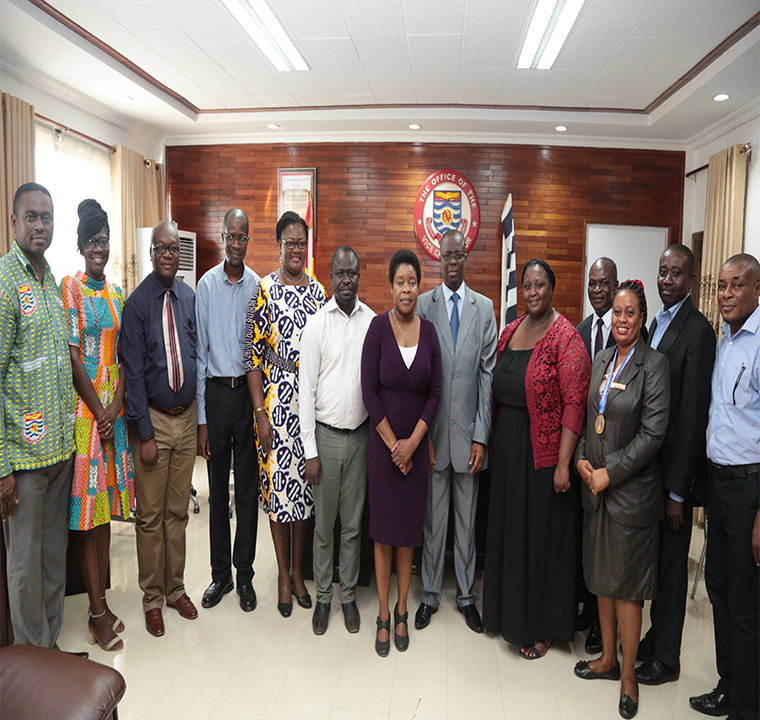 A three-member delegation from the University of Kwazulu-Natal, (UKZN), South Africa, has paid courtesy call on the Vice-Chancellor Prof. Joseph Ghartey Ampiah as part of their working visit to the University. The delegation comprised Prof. Harold Ngalawa (Dean of Research), Dr. Evelyn Derera (Academic Leader) and Dr. Phocenah Nyatanga of the School of Accounting Economics and Finance. Introducing the delegation, the Director, Directorate of Research, Innovation and Consultancy, Prof. Samuel K. Annim, said the three officials were in UCC to explore areas of collaboration with the School of Economics and the School of Business. Prof. Annim said he had opportunity to visit UKZN on a similar mission. Speaking on behalf of the delegation, Prof. Ngalawa said they were in UCC to engage with their counterparts in the School of Business to discuss how they could work together in areas of joint research, staff and student exchanges. He was hopeful that at the end of the delegation’s interactions with the two Schools, they would be able to identify specific areas for the collaboration. Prof. Ngalawa said he was looking forward to the signing of a Memorandum of Understanding (MoU) to enable the two universities to formally begin the collaboration. “African universities need to work together to find indigenous solution to African problems,” he noted. He thanked the Vice-Chancellor for the warm reception and hospitality accorded them. On his part, Prof. Ampiah said the University had collaborations with several institutions of higher education across the world. He however, indicated that the University was interested in South-South cooperation saying “We stand to benefit from each other if we put our strength together to better the lot of our people”. He commended South Africa for demonstrating to the world that Africans had the best researchers any country in the world could boast of. Prof. Ampiah was hopeful that the collaboration would be extended to other colleges and faculties/schools in the University in the near future. He expressed gratitude to the delegation for the visit and assured them of a fruitful collaboration. Present at the meeting were the Registrar, Mr. John Kofi Nyan; Provost, College of Humanities and Legal Studies, Prof. Dora Edu-Buandoh; Dean, School of Economics, Dr. Emmanuel Asmah, Dr. Camara Obeng, Dr. James Atta Peprah and Faculty Officer of the School of Economics, Mr. Ebenezer Aggrey.